Speaker of the House John Boeher is quickly becoming one of the strongest Republican Speakers of all time. He is standing strong against heavy pressure from the Liberal Media, Barack Obama, Democrats in the Senate and even some House Republicans. 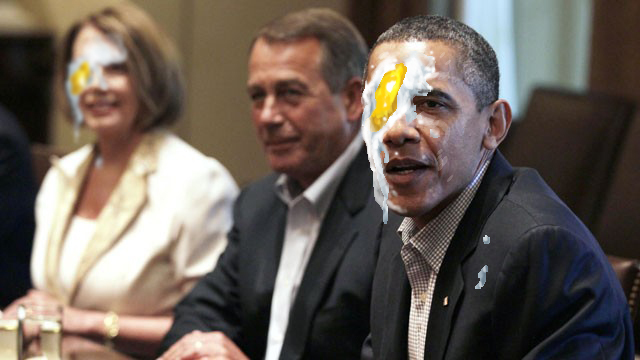 But the strength of his leadership and the contrast to the Democrats' lack of leadership leaves President Barack Obama and other Democrat leaders with the July "Egg on Their Face" award. It is gratifying that Speaker Boehner is standing strong against this pressure. We must not allow the increased spending frenzy of the current Democrat leadership to go unchecked. While this cannot be an "all or nothing" negotiation, Boehner has the power to move the ball significantly in the direction of fiscal Conservatism. This has been a rough week in Washington DC. The President accuses Republicans of acting like children and then storms out of a negotiation meeting like a spoiled child. Don't you get tired of him talking to us like we are his kids? While there are threats of lowering our credit worthiness if we don't take action, what will happen when we do raise the debt limit and then are back in the same situation of increasing spending with no hope or plan for paying off the debt? Will these same agencies lower our rating for irresponsible spending and borrowing? I think they will. We are not headed towards default unless the President wants us to default. Florida Senator Marco Rubio told Rush Limbaugh and his audience earlier this week when asked about this, "He (Obama) can stop it right now by basically saying, "You know what, we need to do something to grow our economy. Let's pass tax reform. Let's pass regulatory reform." He can stop this by also starting to implement some of the spending measures we think are necessary. He can also stop it by basically prioritizing spending on certain things if it comes to that. But let me tell you one thing, Rush, that no one said yet or maybe they have, the fact that payments on Social Security and Medicare may stop is a stinging indictment and a wake-up call. What Americans should realize, 'Hold on a second, my Social Security check and my Medicare benefits are borrowed? The money that you're using to pay for my Social Security are borrowed? I thought I paid into a trust fund. I thought I worked my whole life to pay into some system and now you're paying my money back and you're claiming that the money is being borrowed?' That's what they're basically conceding when they're saying this." Support our Republican Leaders. Let them know they have the support of the American People to stand strong against the liberal spending of Barack Obama. We will prevail now and in November of 2012 only if we stand strong. In case you are wondering how we are doing? The latest Gallop Poll shows any as yet named Republican would defeat President Obama by a 47-39 margin if the election were held today. This is margin is greater than last month's polling. Obama is going in the wrong direction for our country and the polls show it! Stand Strong - Vote Republican. So we take the Clinton surplus, squander it and run up huge HUGE spending under W, and the Republicans are fiscally prudent? I don't think so. The debt has far less to do with entitlements than the money spent in Iraq and Afghanistan. I am a true Republican--people like Cantor and Boehner are corporate-owned clowns who have no idea how to think for themselves. I remember when Republicans spoke for little people--now they seek to fool the lower and middle class into thinking that their policies somehow help them (uh, trickle down has never worked). If you think protecting the very rich from taxation is the sole purpose of Republicanism, then you have no idea what Republicanism is, which is this: the belief that actually balancing the budget, as opposed to just talking about it, is sacrosanct (again a reminder that the fiscal imprudence occurred during W). That slow change, while necessary, must be balanced against the traditions of the United States, ones that have mostly served us well over two centuries. That foreign military adventures should be limited to our real national security interests--not vendettas. And one of the single most important components was protecting the economic interests not only of an elite few, but of the great many Americans who toiled in our factories and fields. This party was known as the Republican Party, and one could at least see some logic in their beliefs and understand that they were doing what they thought was right for the United States of America.